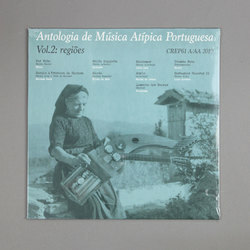 Various Artists - Antologia de Música Atípica Portuguesa Vol2, Regiões. Vinyl LP. Bleep. In 1959 Michel Giacometti moved to Portugal and dedicated the following thirty years of his life recording traditional music all over the country. In the present decade Portuguese music has been thriving and finally travelling abroad, long gone are the days those hidden gems were kept in secret in this distant corner of Europe. The discovery of current Portuguese music sparked an interest to Portuguese music, past and present. With both of those ideas in mind, Giacometti and the interest in Portuguese music, “Antologia de Música Atípica Portuguesa” creates an anthology of current sounds to the future. You can see it as history being made or a broad catalog of sounds that live and breathe the experimental and electronic that is happening in Portugal. The first step happened two years ago with the releasing of the first volume on this anthology, “O Trabalho” (“The Labour”) and we now move onto Vol. 2, “Regiões” (“Regions”), with each track connecting with a different province from Portugal. Some names return to this volume, like Live Low with the beautifully haunting “Montemor” or Gonzo (our own Gonçalo F. Cardoso), affirming his path in building detailed and processed field recordings music. More than a list of names, or songs, this second volume of “Antologia de Música Atípica Portuguesa” recreates a passage throughout different landscapes of Portugal, constantly leaving a trail of past, present and future. The trail doesn’t limit itself to the music, but to the traditions contained in the sounds and the stories spelled by the words. The beautifully slowed haunting-waltz “Por Riba”, by Síria (Diana Combo), sets everything in motion and builds the way to Random Gods’ upbeat march “Gazulo à Estronca da Santosa”. “Malta Inquieta” (Ondness) embraces the most modern/contemporary side of this volume, proving that “Regiões” goes beyond the idea of catalog or even its own concept of “anthology” and provides music that’s hard to categorize or even judge by modern standards. We are not afraid to say it: “Malta Inquieta” is an experimental jazz-electronic modern gem. It’s followed by the guitar of Rui Carvalho, aka Filho da Mãe, with “Manta”, closing the A side with one of his enchantments. B side strikes with the aforementioned “Montemor”, setting the tone for a different trip, building up on more abstract and freeform music by Banha da Cobra (“Asylo”), Fantama (“Lamento das Beiras”) and the track by Gonzo. “Regiões” finishes with the right tone, fields recordings worked by Luís Antero, that tie the connection between Giacometti and the now - with the now still happening and building up on the story of the future “Antologia de Música Atípica Portuguesa”.